The great Utagawa school artists of the mid-nineteenth century developed areas of specialization that not only allowed them to avoid competing with one another but also lent themselves well to collaborative projects. This triptych with landscape by Hiroshige and figures by Kunisada is from a series illustrating the immensely popular serial novel Imposter Murasaki, Rustic Genji, by Ryūtei Tanehiko (1783–1842), which parodied the classic eleventh-century novel The Tale of Genji. 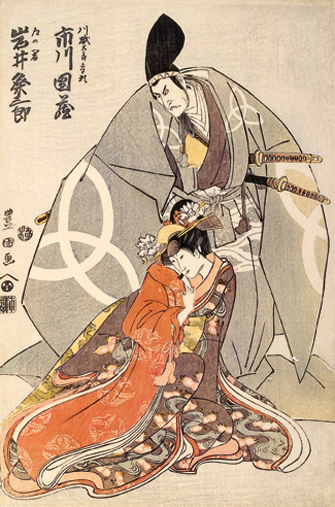 The later story unfolds in the pleasure district of fifteenth-century Edo instead of in the imperial court of Kyoto. 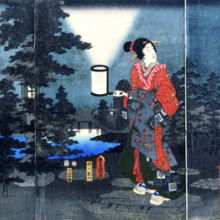 In this rare evening scene, the printer has created the blurred edges of the beam of lantern light by carefully wiping the blue ink from the carved block. 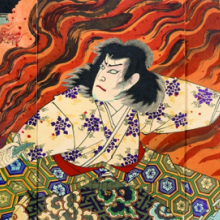 In this triptych, the actor Ichikawa Sadanji I is surrounded by flames in a climactic scene from the historical play The Kōshū War Strategy and the Takeda Clan Preparing for Battle. The print comes from a series commemorating plays performed at a theater that Sadanji had recently taken over as manager and lead actor. The bright pigments, many of them aniline dyes that had not been available in Japan prior to the 1860s, intensify the excitement of the drama. The actor’s pose captures the moment before he thrusts his sword into his abdomen in ritual suicide. 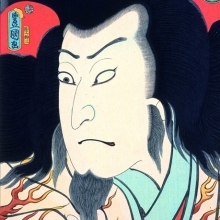 This series of close-up actor portraits was one of the last projects Kunisada undertook, and he was unable to finish it before his death. It includes depictions of actors in roles that they had played years before—a departure from the common practice of celebrating only the latest productions. Designed as a grand finale for the artist’s career, the portraits were printed with the most expensive materials and techniques. This print is on thicker paper than usual and features multiple shades of black for the hair, embossing on the white robe, and the application of a clear gloss to create a nearly invisible pattern on the light blue collar. This print is in a rare, oversized format known as nagaban. 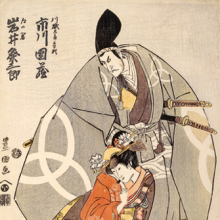 It shows the two principle characters of the popular kabuki play Love Suicide of Ohan and Chōemon at the Katsura River, which tells the true story of a doomed relationship between a thirty-eight-year-old silk merchant and his fourteen-year-old neighbor. 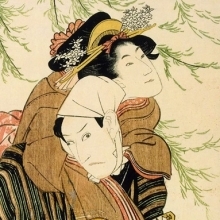 The image of a man carrying his lover, and the presence of a willow tree in the background, refer to an episode in one of Japan’s great literary classics, the Tales of Ise, in which a future empress elopes with a poet. Like many designers of Yokohama-e, Hiroshige II took considerable liberties when depicting an exotic Western subject. Here, an image claiming to depict America is actually based on a picture of the Frederiksberg Castle near Copenhagen, Denmark, published in the Illustrated London News in 1860. Among the details added to enhance the picture’s appeal are palm trees and dramatic mountains in the distance and a wide array of colorful costume fabrics. 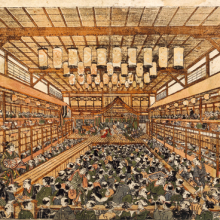 Perspective pictures of theater interiors provide some of the best visual documentation of Edo period architecture. The massive wood structures featured a roofed stage and two-story viewing galleries. Actors entered and exited the stage on a wood-planked walkway that ran along the left side of the theater. Kabuki productions were rowdy social gatherings where people talked during the performance. Vendors selling food and drink are seen making their way through the crowd. Utagawa: Masters of the Japanese Print, 1770–1900 presents more than seventy prints from the renowned Van Vleck collection of Japanese woodblock prints at the Chazen Museum of Art, University of Wisconsin–Madison and approximately twenty prints from the Brooklyn Museum. 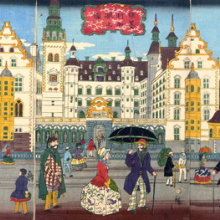 The Utagawa School, founded by Utagawa Toyoharu, dominated the Japanese print market in the nineteenth century and is responsible for more than half of all surviving ukiyo-e prints, or “pictures of the floating world.” Colorful, technically innovative, and sometimes defiant of government regulations, these prints were created for a popular audience and documented the pleasures of urban life and leisure. The prints represent famous places, landscapes, warriors, and kabuki actors; they were reproduced in books, posters, and other printed materials for mass consumption, and they fed a thriving Edo publishing industry. This exhibition has been organized by Laura Mueller, Van Vleck Curatorial Intern, Chazen Museum of Art, and Doctoral Candidate, Japanese Art History, University of Wisconsin–Madison. The Brooklyn Museum’s presentation has been coordinated by Joan Cummins, Lisa and Bernard Selz Curator of Asian Art, Brooklyn Museum. Utagawa: Masters of the Japanese Print, 1770–1900 is organized by the Chazen Museum of Art, University of Wisconsin-Madison. The exhibition is supported in part by National Grid. Additional support is provided by the Alvin E. Friedman-Kien Exhibition Fund, Joan B. Mirviss, Ltd., Scholten Japanese Art, and the Brooklyn Museum Asian Art Council. Joan Cummins, coordinator of our presentation of the exhibition Utagawa: Masters of the Japanese Print, 1770–1900 and the Museum’s Lisa and Bernard Selz Curator of Asian Art, give an overview of the exhibition.